When Advantage Plastic Products wanted to help OEM Pro-Cut International cut costs on the probe arms of its Discus Rotor Measuring System, it called on engineers at RTP Company. “Pro-Cut was originally going to use cast zinc, machined aluminum or other metals. When they discovered how costly it would be, they realized the best solution was injection moldingÑif the right material could be found,” said Joel Beaudette, Vice President of Sales for Advantage. 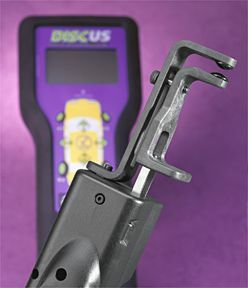 Comprising a total of twelve molded components, the patented Discus System is used by mechanics and inspectors to simply and accurately measure brake rotor wear and compare it to manufacturers’ specificationsÑall without removing the tires from the vehicle. The System measures both thickness and lateral runout and generates a hard copy printout of the data, providing a measure of confidence to the consumer that all recommended work is legitimate. The System is the winner of Motor Magazine’s Top 20 Tools Award in the year 2000. The handheld unit features two spring-loaded arms that must remain parallel, even through a 90 degree bend. The arms are molded from an RTP 4000 Series polyphthalamide specialty compound with 50% carbon fiber. Tensile strength of 41,000 psi (282 MPa) and flexural strength of 60,000 psi (413 MPa) provide ample stiffness and maintain dimensional tolerance over two planes (perpendicular and parallel) to ensure measurement integrity. After several product review meetings between Advantage and Pro-Cut engineers, Advantage narrowed its search to three materials based on performance criteria. At that point, RTP Company was contacted to review the extreme demands of the application. Initial “can it be done?” questions were directed to RTP Company’s proactive design analysis specialists, followed by on-site visits during the mold design stage by technical service specialists from the South Boston plant. “We were very impressed with the support RTP provided throughout this phase of the project. This wasn’t an easy task, but the material’s performance was exactly what we had hoped for,” continued Beaudette. Pro-Cut International is a worldwide leader in on-car brake technology. Call them at 800-543-6618 or visit their website at www.procutinternational.com. Advantage Plastic Products, a full-service molder, is located in Manchester, New Hampshire. Call them at 603-629-9540.